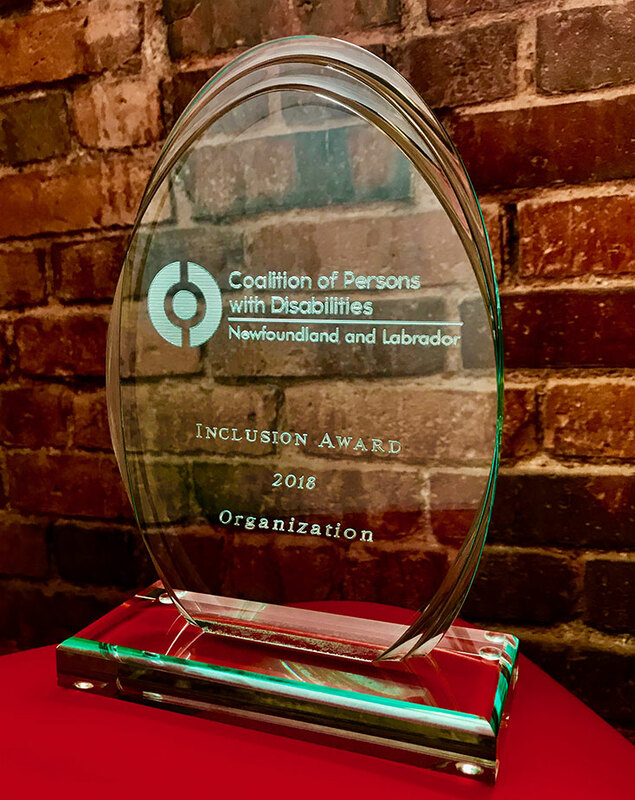 June 21st, 2018: The Coalition of Persons with Disabilities recognized The Newfoundland and Labrador Folk Arts Society (NLFAS) with their 2018 Inclusion Award for an organization. The importance of this award dives deep into the grain of NLFAS board members and partners, leaving a feeling of encouragement and reassurance that their accessibility/inclusion efforts have been actionable. We, who look to the past and future for inspiration, matched with intentions to include others in living and enjoying the traditions of Newfoundland and Labrador, hone moments like these — moments where the organization of features that provide everyone with an opportunity to join in the celebration of our province’s culture is working. The result being that Persons with Disabilities attend and take part. John Drover, President of the NLFAS, attended the annual general meeting to accept this award on the organizations behalf. John tweeted that “We (NLFAS board and partners) try to do a little better every year” when it comes to Accessibility. Sunday, July 18th on VOCM’s Folkus, Kathy Hawkins will chat with host, Greg Smith, on behalf of our partnership with Inclusion NL to discuss this years NL Folk Festival features. Listen in, check out the Accessibility Features on our website, and call our Inclusion Hotline, 709-697-3323, with your questions and ideas. The NLFAS would like to extend a big thank you to CODNL, Inclusion NL, TD Canada, and our grand volunteers for your help in this initiative. Here’s to an accessible future!